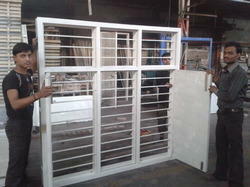 Leading Manufacturer of window ventilated, school windows and ventilated windows from Surat. 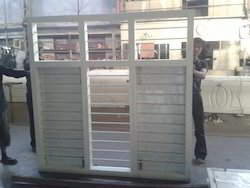 Window Ventilated are constructed of welded 1" x 1" and 1" x 11/2" 16 gauge (wall thickness) steel tubing. Wire mesh sections are constructed with 7 gauge welded wire, welded on 11/8" horizontally spaced by 6" vertically spaced centers. Frame and wire are hot dip galvanized after fabrication. These Ventilated College Windows are extensively used in schools and colleges for protection and as well as for ventilation. Ventilated Schools Window are to be constructed of PVC matched to that of the Sheet frame window system or of proprietary products available in or PVC.Due to the range of options available, appearance can be altered to suit specification requirements, by either locating the ventilator over or through the framing. All Sheet frame ventilation systems are designed to comply with the Building Regulations requiring 4,000mm² free area per habitable room. Ventilated Windows are constructed of welded 1" x 1" and 1" x 11/2" 16 gauge (wall thickness) steel tubing. Wire mesh sections are constructed with 7 gauge welded wire, welded on 11/8" horizontally spaced by 6" vertically spaced centers. 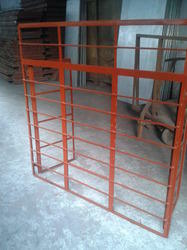 Frame and wire are hot dip galvanized after fabrication. Looking for Ventilated Windows ?